Easy Six inherited speed from both sides of his pedigree. On the top, he was an own son of the great Easy Jet that had a speed index of 100. On the bottom, he was out of the race mare Peggy Toro, that also had a speed index of 100. Easy Six himself was the winner of just under $200,000 and earned a speed index of 97. He sired only 180 foals from three (3) crops, yet these offspring earned over $2.6 million on the track. He was obviously on his way to being a successful producer of fast horses. Easy Six will always be one of those horses we will have to wonder about. What if ... what if he had lived to produce the large number of offspring that his great sire Easy Jet produced? But that was not to be. His life was cut short by colic in 1978 at 6 years of age. How has Easy Six contributed to the barrel racing industry? Perhaps the best indication of his potential and his contribution can be seen by a review of the "Top 50 Sires" list. Easy Six produced two sons who have had a significant impact on this list. One was Six Fols, the sire of Marthas Six Moons. 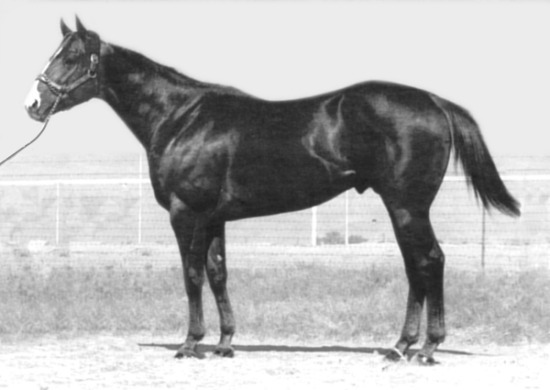 The other was Streakin Six, a barrel horse producer in his own right, and also the sire of the late great Packin Sixes. In 2006, our foal crop will include full brothers or sisters to these horses, that are out of own daughters of Bugs Alive In 75 and On The Money Red!